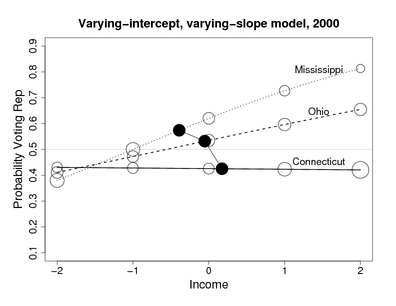 We find that income matters more in “red America” than in “blue America.” In poor states, rich people are much more likely than poor people to vote for the Republican presidential candidate, but in rich states (such as Connecticut), income has a very low correlation with vote preference. In addition to finding this pattern and studying its changes over time, we use the concepts of “typicality” and “availability” from cognitive psychology to explain how these patterns can be commonly misunderstood. Our results can be viewed either as a debunking of the journalistic image of rich “latte” Democrats and poor “Nascar” Republicans, or as support for the journalistic images of political and cultural differences between red and blue states — differences which are not explained by differences in individuals’ incomes. We have also found similar patterns in election polls from Mexico. MS, OH, and CT represent poor, middle-income, and rich states, respectively, and the red, blue, and gray lines on each plot represent frequent church attenders, occasional church attenders, and nonattenders. We’re still trying to make sense of it all. Fascinating. I wish I could hear/see your talk. Will you post the powerpoint? The talk is here. It has a bit of psychology in it, actually, which most people like but the political scientists are very suspicious of.